Hurray for Friday! I’ve had a crazy exciting week and can’t wait for the weekend. This week’s Friday’s Fancies centers on fall colors. I decided to cheat and make my outfit a combination of fall and my curtain fabric. And I decided to subtly pick up the diamonds in the fabric. Now on to the show! After looking at different styles of curtains, I decided to go with hidden tabs on the top. That style (vs. a pole-pocket top) looks cleaner to me. Plus, it’s not as fussy as pleats. Sewing curtains wasn’t as hard as I thought it would be. The hardest part was taking the measurements and calculating everything. I even drew a mock-up to make sure I wasn’t missing anything. I love this stuff. First, hang the curtain rod to figure out how long the curtains need to be. Our curtains would need to be 94 inches from the curtain rod to the floor. 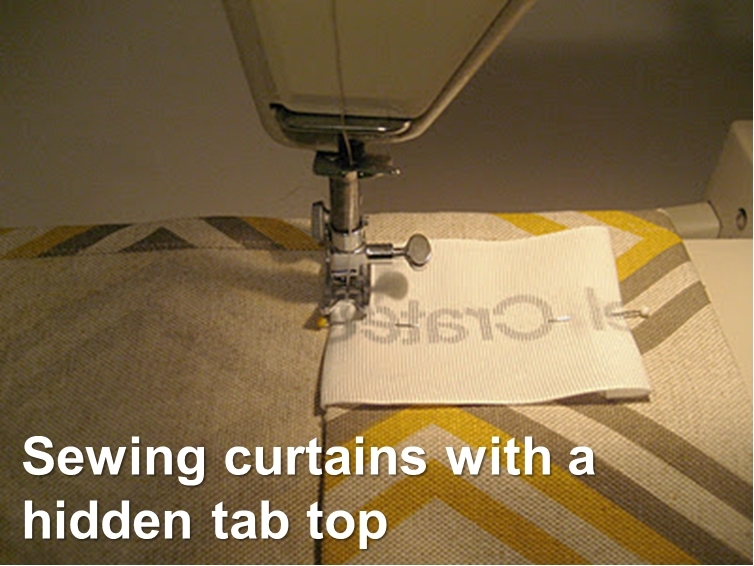 To figure out the tab top, I used our Ikea Vivan curtains and this tutorial as a guide. For the actual tabs, the tutorial used heavy grosgrain ribbon. Sturdy and less sewing….perfect! I pulled out some extra ribbon (yes, it’s from wedding gifts from three years ago). John kept trying to throw it out, but I knew it would come in handy at some point! The tabs on the Ikea curtains are 2.5 inches wide, the same width as the ribbon. The curtain panels are about the same width as my fabric. Ikea has 8 tabs at about 5 inches apart. My curtains would have 8 tabs at about 5 inches apart. The tabs were 3 inches long. So I cut 16 4-inch pieces of ribbon (3 inches, plus a 1/2 inch on each end to be ironed under). Easy breezy. Also, the Ikea curtains have 1 inch of fabric above the tabs and where the curtains will hang. That meant I needed 4.5 inches more for the top (1/2 inch ironed under and 4 inches for a wide hem at the top). I cut 2 105-inch panels of fabric. That’s 4.5 inches for the top, 94 inches for the actual panel, and 6.5 inches for the bottom. I gave myself plenty of wiggle room since I wanted to make sure the top of the yellow diamond was at the top of my curtain panel. Plus, I wasn’t sure how wide I wanted the hem to be at the bottom. Since these were going to be curtain panels, I just used the width of the fabric (56″ wide – that is 54 usable inches – not including the selvage). I needed 1 inch on each side of the panel (1/2 inch folded and ironed and one more 1/2 inch folded and ironed for the hem). I didn’t cut the sides because the selvage would be hidden in the hem. Now that I had my fabric cut, it was time get my iron and sewing machine on. I folded and ironed under a 1/2 inch on each side of the ribbon tab. Then I folded and ironed 1/2 inch on each side of the length of the fabric. Then I folded over and ironed another 1/2 inch on each side of the length of the fabric. Now the raw edge of the fabric was neatly tucked inside my 1/2 inch hem. The crisp seams meant I didn’t have to pin the hem and could go straight to the sewing machine. Sew the 1/2 inch hem on each side of the length of the curtain panel. Now that the sides were complete, it was time to tackle the top of the curtain. I folded under and ironed a 1/2 inch. Then I folded over and ironed 4 inches so the back would have a clean finish. This also created a pocket if I ever wanted to go the pole-pocket route. Time for the tabs! I tucked the bottom fold of the ribbon underneath the folded fabric. Then I pinned down each side of the ribbon tab. This created little “belt loops” for the curtain rod to slide through. After the tabs were pinned about 5 inches apart, I took everything over to the sewing machine. This is a better view where you can see the bottom fold of the tab tucked under the fabric. I sewed the bottom part of the tab and hem first. Then I sewed the top part of the tab, making sure I had my 1 inch hem at the top. Here’s the back of the curtain with the completed tabs! And here is the final product! Yes, I still need to finish the bottom hem. Here’s another view of the curtains with our extra long curtain rod. It’s actually two Ikea Beskada 38 – 152″ curtain rods. With the wider rod in the middle and two skinny rods slid into each end. Not too shabby for custom curtain panels and the rods. A single panel from West Elm is about $44, so two panels would be about $96, including tax. I love the curtains (John too!) and they definitely bring a little flair to the mostly brown and beige space. We have light beige walls, beige carpet, the brown leather couch, and brown furniture. Now it’s time to add a little more color to the room and figure out the seating/coversation zones. Oh, and tackle the clutter and (my) dumping zones. We may also add another layer of curtains or something to cut the glare on the TV when it’s bright outside. Hope you have a fantastic fall weekend! « Let’s Go Apple Picking! Love the dress but love the curtains more! great tutorial. newest follower, looking forward to getting to ‘know’ you! Great tutorial. We will be redoing our curtains soon. Some our windows are bare, so I will definitely refer back to this. Thanks so much. I love it! 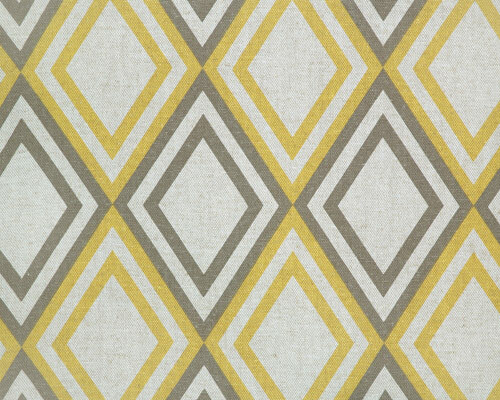 Your curtains look fabulous – like the modern/a little bit retro fabric and yellow always rocks in my opinion. My crafty (and also an accountant!) mother helped me figure out how to do the tabs on my curtains. I’m glad you found my tutorial useful. 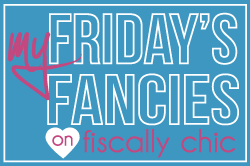 Cathy- can you put a link to all your Friday fancies ideas together so I can look at the easier when I am shopping! I’ll get started on my post about tornados just after we clean up from the hail damage… I guess I’ll have two posts! thanks for the tutorial! Very helpful in making curtains for my family room! thanks so much for sharing! thanks for the tute, but the link to the tab top tutorial takes me to a page that doesn’t exist anymore. you wouldn’t happen to have it saved somewhere else? i’m trying to estimate from your pictures just how far down the curtain the tabs and rod sit. looks like an inch and a half? thanks for sharing this. i don’t know how people like you find the time, but it sure helps us time deficient folks! I just read this excellent tutorial. To answer Jeremy’s question, the tab tops are stitched 1 inch from the curtain top, and so that is where it sits on the pole. great tutorial. My sister bought some fabric months and months ago for me to make her some back tab curtains. I was just about start and so off to google. I found your tutorial and I was amazed when it was the SAME fabric!! Thanks for the easy tutorial and of course you have great taste! I am enjoying the rest of your blog. I also love cupcakes and sewing! Sonia – I sewed all the way across, not just on the tabs. Wonderful directions and great pictures — everything actually makes sense and definitely looks “do-able”. You make it sound so easy, and I’m looking forward to trying my hand at it. Thanks for your great tutorial! Brilliant tutorial! Thank you! I’ve been designing mine and this incorporates everything I’m looking for with beautifully finished details! We went with the IKEA curtain rods too. Hi! I love your tutorial but you didn’t mention where you got the rods? 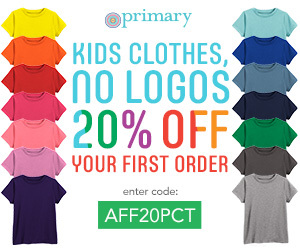 Or did you make them? I am looking to do a wall to wall curtain rod with no “nub” on the end just straight like you have it. any suggestions? The finials are installed separately, so you could always leave them off. Hi, How do you draw your curtains all the way across to the middle? It looks like the brackets holding up the rods would be in the way? Kate – Thank you! We didn’t shut the curtains all the way, they were more of a decorative accent.